Give Kids The World Village (GKTW) is an 84-acre, nonprofit resort in Florida that provides a special vacation home for children with life-threatening illnesses and their families. GKTW provides 168 fully-furnished villas at its resort, donated attractions tickets, meals and more for a week-long, cost-free fantasy vacation. With the help of many generous individuals, corporations and partnering wish-granting organizations, GKTW has welcomed more than 154,000 families from all 50 states and 76 countries. With its neatly manicured lawns, colorful duplexes and playful, whimsical buildings, it looks more like a make-believe suburban development than an all-inclusive resort. Give Kids The World Village is both… and neither; it’s a non-profit Village where children, whose last Wish is to visit central Florida’s theme parks, stay with their families for the time of their lives. Give Kids The World Village accommodates these kids with handicap-accessible homes that sleep up to 7, plus one baby in a crib, and supervised on-site activities designed to make travel easy for families with children with a variety of disabilities. Once these children have been identified by a wish-granting organization that provides airfare, Give Kids The World Village fulfills the Wish of a lifetime. During the day, the families visit world-famous attractions and theme parks of Central Florida. In the evening, they return to a Village teeming with themed parties, events and surprises. Delighting all members of the families are events such as the “Village Idol” weekly talent show, horseback riding and playing Candy Land on the world’s largest version of the game at Matthew’s Boundless Playground. 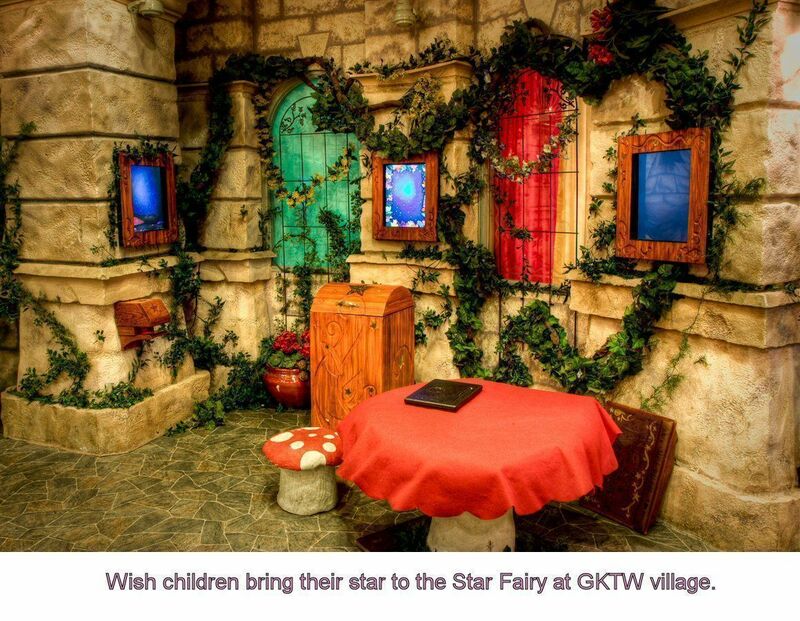 One of the magical moments enjoyed by children visiting GKTW is personalizing their gold star and placing it in the Castle of Miracles and the Star Tower. Their twinkling star remains always, and is a symbol of their light. In honor of the 30th anniversary of GLTW in 2016, a special song “When a Wish Becomes a Star,” was created by composer Rick McKee. The Gallery of Hope visitor center is a tribute to the founder; corporate sponsors like Walt Disney World Resort, Universal Orlando, SeaWorld, Walmart, Hasbro and individual donors whose role has been critical to the continued success of GKTW. 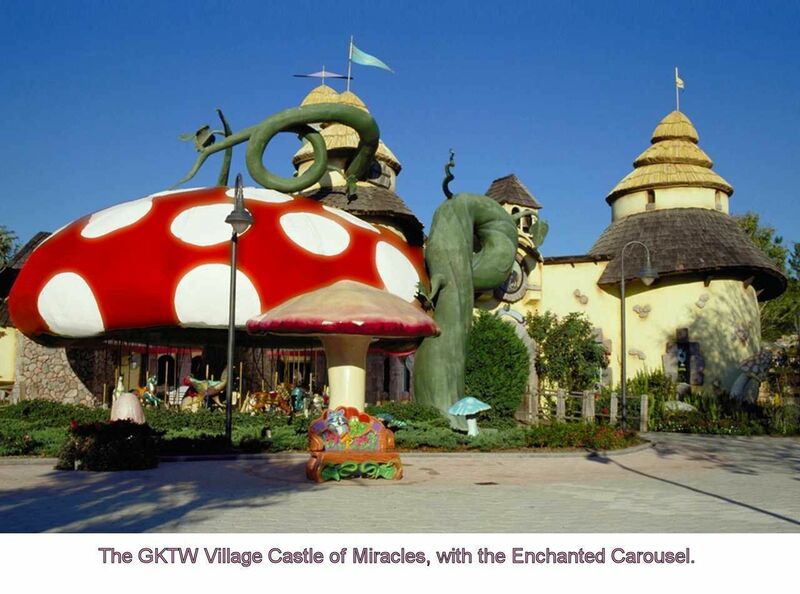 New initiatives continue, and in addition to building more units for its guests, there is also talk of expanding the successful GKTW model to another venue, perhaps southern California. More than 1,400 volunteer shifts are needed to keep up the great work at GKTW, and, to-date, over 3 million volunteer hours have been logged. Volunteers greet anxious families at the airport, because more than 80% of families living with traumatic illness never have an opportunity to travel at all. Upon arrival to the Village, volunteers also check-in the families, help them settle into one of the 168 onsite villas, deliver meals, and provide evening entertainment and activities. Volunteer opportunities keep expanding, so that even visiting conventioneers and vacationing families can schedule a day to help out and give back. Click here to check out volunteer opportunities and procedures. Additionally, Give Kids The World Village welcomes more than 20 colleges each year for Alternative Spring Break, a week of volunteering instead of the traditional spring break experience. Here’s a video that helps you envision their mission. The Give Kids The World Village is located in central Florida at 210 South Bass Road, Kissimmee, FL 34746. For more information about making a contribution and the many ways in which your family can become volunteers, call their offices at 800/995-KIDS or visit Give Kids the World online. Everyone that visits Give Kids the World comes out very please, that's because of the great treatment and better yet for its facilities, well thats what people see from the outside what goes on inside is a different story. The worse this that could ever happend to any one trying to provide for their home, I am a ex-employee and I want the world to know while you may see all of us with a smile in our face, thats not what we truly feel. In this company there is what's called competition for power, also hatred between employees and most of all ethnic racism there is no such thing as employee relationship due to the bad administration that depends on what people can say there for approving of those they like and getting rid of those that they don't that many not occure with all hispanics only with those thats are not liked.The sad part about all of this is that every conversation White American has with their Group is no simpler then how they are going to get rid of the next guy without even investigate anything about that person as has happend in the past few months all put together but a group whos leader is Richard Bortula (profecional racist) and has use people like Jhon Bushko to put together stories about all the hispanic which get carried out to the person in charge of executing their employees no matter how profecional or respectful they are whith out any respect the person I am talking about is Neal McCord Acompanied by the person in charge of human resorces Taberi Scott(another racist). She is in charge of dismising inocent hispanic for no operant reason yet the other American who have been know for several offences and untocheble for these two people. The last thing is when Richard Bortula uses two other latins to accuse another latin of racism that leading to his dissmisal and not giving him any explanation not even the benefit of the doubt. Ladies and Gentelments unfortunately this is an institute were the main goal is to provide well being and happy relationships but all of this happenings is due to the administration once again. All I have to say is, what kind of dreams is a kiss going to have when his or her dad cant buy them a chritsmas present, This is not a dream this is a Nightmear. So sad to see the "Dreams for some..nightmare for others" post. You know real life is hard..
especially if you are fighting a life-long..life-threatening battle as a child. We live in a sin cursed fallen world where bad things happen to good people..to the person who endured hard times while working at GKTW…may you be blessed for putting on that smile during times of adversity…but the village is ultimately about the kids who may never see the light of another day! Sorry your behind closed doors experience was bad..but that's because you are dealing with humans who are imperfect. (which isn't an excuse..but unfortunately true). That's what makes GKTW such an awesome place for those it was created for. To be able to put a smile on kids faces who endure harder times than any of should have to is something to be proud of and a miracle. My daughter was there in the spring and our family will always have a special place in our hearts for every person who has spent time making miracles happen there. May God bless you for your valiant efforts and I pray you will find a job that will supply all your needs and provide more than enough for your family this Christmas. My granddaughter and I have not yet been, but have heard nothing but good stories about Give Kid's The World Village. We cannot wait to go there we are so looking forward for our visit. I can't remember ever seeing my granddaughter this happy and excited. We as a family were so fortunate for our little boy Corey to have his wish come true by going to Disney World. But I believe what made his wish wonderful was the stay at GKTW. We were treated like kings and queens every day. Corey and his siblings talk everyday about GKTW. I can only hope that you are able to continue your kindness and generosity that was showed to my family.You and the staff made us forget about what we were going through for a week and for that we thank you so very much. It is wonderful to have a place like this for families to forget about the everyday life that they face when fighting childhood cancer. You are the best. The Daniels-Green family. Have a wonderful time there. It's great that this facility exists to bring pleasure to the families of those who suffer these illnesses, and also wonderful that the volunteers are so generous with their time. my family enjoyed there selves when we visited your village,we hope to come visit there again.Unfortunately it wont be with our son Aakiyr Burton,he passed away on April 05,2008.He was the child the wish was for.We visited your village on June 17-23 2006.
good article.like it very much,thank you. It's pretty much an amazing page. thanks! I am planing a big family travelling, maybe it is a great help to me…. This valuable editorial was very useful to read, I savored it completely. I'm about now to email it to my colleagues to permit them to examine this too. Thank you really. I'd love to go on such a trip with my family! I am not sure if you know that the information you have shared above is unique and if you Google it, you would not find any similar! Thus such posts are very useful for many readers as I am! May I ask you, how do you choose topic for your writings and where do you get infoâ€™s for it? Thanks in advance. Definitely plan on booking a trip like this for my family soon!! Our family had been so excited to go on our make a wish trip.My daughter was diagnosed with a terminal cancer at age 2,and we waited till this month to go,so we knew she would be healthy enough to enjoy herself.When we got there we were very tired and it was around 5 in the afternoon.I first noticed the strange odor when we walked in the room,it was like they were trying to cover up something.Then later that night I started seeing little bugs everywhere.I am not native to Florida,so I thought it might be just some outdoor bugs.Then as the days went by,i kept seeing more and more.Knowing this trip was free,I didn't want to complain to much,but by the 3 rd night I was horrified.I got up to check on my daughter and there were bugs all over the kitchen counter.I was so disgusted,I slept in the car that night.My husband complained the next morning,and they sent a technician in.They were water bugs.That is so nasty.We did get moved,but the next room wasn't that clean either.This is a place for sick kids,and the rooms aren't clean.Come on.Then as we were walking to the restaurant,and man was spraying chemicals around the side walk,and he had a respirator mask on.So whatever he was spraying must have been really poisonous.And here he is spraying it around sick kids!!! I'm glad others had a good time,and loved this place,but I was not impressed. Give Kids The World Village provides week-long vacations in handicap-accessible homes, with all meals, on-site actions and attraction tickets to families with children with serious illnesses. It is so much exciting to visit your blog and the articles are really awesome considering the way of writing. I was very happy that I found this website. I needed to thank you for this great information!! I definitely loved every bit of it and I have bookmarked your site to look at the new stuff you post later on. Wow amazing resort I really like it. I am planning a big family travelling, maybe it is a great help to me. I will bookmark your blog for future updates. That's a great creativity and fun living place for children. I think Henri Landwirth has done a real great job for children knowing the ancient time and with that enjoying the world village of fairy tales and lot more. It's best to give kids the best experience they could have in their lives. Great page iNdeed. thanks for sharing. The blog is really informative. The idea of having such wish granting resort for children is appreciating.Those who have children with life threating illness can make their children happy by visiting this. The services the resort provides seems to be very good. Thanks for posting this Info on GKTW. I haven't found anything like this anywhere else!